David Fincher has recently commented about the infinite number of ways someone can shoot a scene, but to him ‘there’s a right way and a wrong way’. Fincher does it the right way in every scene in this picture. Fincher renders Flynn’s ostentatious material with a mix of procedural precision, emotional realism and healthy doses of social commentary on mass media. Ben Affleck as Flynn’s tormented husband searching for the mystery behind the disappearance of his wife, is a sly bit of casting. Affleck’s frequent onscreen persona as a handsome privileged dickhead (think Dazed and Confused, Mallrats, Changing Lanes) helps us immediately understand the character of Nick Dunne, a frustrated husband living in smallish town Missouri at the end of his marriage. As Amy Dunne Rosamund Pike wears her character like a second skin, a woman scorned by her husband’s disinterest in her, and feeling lonely and isolated. As the title suggests action is set in motion when Amy goes missing, leaving only a few traces of evidence of a potential murder. Kim Dickens, underrated character actor from almost everything, finds a high profile meaty role as the lead investigator. With understated intelligence Rhonda Boney follows the trail of breadcrumbs to Nick’s suspected involvement. It doesn’t take long for the story to catch fire in the press, latching onto a steamy narrative of this surly husband knocking off his innocent wife. Media hysteria escalates along the lines of early 90’s cause-celeb trials of OJ Simpson, The Menendez Brothers and Pamela Smart, wherein Nick can’t even leave the house without a horde of reporters following him. Somehow he manages to sleuth different breadcrumbs toward his wife’s own psychological problems. Past and present co-exist harmoniously creating a clever psychological battle of wits of husband and wife, even though they are rarely in the same room together. Is Nick the murderer? Is he being framed? If so, by whom? Is Amy a Machiavellian trickster plotting a grand scheme of revenge? Deliberately twisty, anything less than the two and a half hours running time would not do the material justice. One could even split the film into specific chapters with their tidy narratives, themes and arcs. As told mostly in flashback Amy’s story is given as much weight as hubby Nick’s and Fincher is clear to paint both characters in shades of grey. Most of us have seen/read enough mystery novels/films to be able guess any number of potential outcomes, but the best potboilers find their thrills in the journey to get to the end. 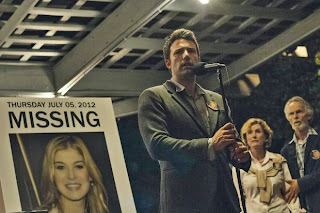 And Fincher’s seemingly effortless directorial choices wring tension and suspense in every moment of doubt. One of the underrated weapons of David Fincher’s arsenal is a razor sharp eye for editing. And the credited editor, Kirk Baxter has the precision of a surgeon. The picture’s opening credits is for instance perhaps the quickest credit sequence in the history of cinema, clever superimposed over a quick montage designed to establish the location. And after this picture there’s no doubt, Fincher and Baxter are the modern masters of the montage. There’s a lengthy sequence in which a lot of information is revealed and visually demonstrated in flashbacks. And yet, with mindboggling skill Baxter and Fincher craft a delirious symphony of cinema putting us into a hypnotic trance which hooks us for the rest of the picture. Gone Girl finds David Fincher at his most confident, elevating salacious airport fiction into an elegant and captivating cinematic delight.